Astrid Lindgren, author of many popular books for children, won the Hans Christian Andersen Award for her contribution to children's literature. 1907Astrid Anna Emilia Ericsson born November 14 in Näs, near Vimmerby, Småland; second child of Samuel August and Hanna Ericson (brother Gunnar born 1906; sisters Stina and Ingegerd born 1911 and 1916, respectively). 1914Astrid begins attending school, and Näs receives electricity for the first time. 1924Starts work at the Wimmerby Tidningen, the Vimmerby newspaper. 1926Moves to Stockholm for a secretary schooling; son Lars born December 4. 1931Astrid Ericsson marries Sture Lindgren. 1934Birth of daughter Karin, May 21. 1941Lindgren family moves to apartment in Dalagatan in Stockholm, where Astrid Lindgren lives since. 1944Writes her first story, Pippi Longstocking (Pippi Långstrump) as a birthday present for her daugther; second prize of Rabén & Sjöt;gren for her first Britt-Mari book. 1945Pippi Longstocking wins first prize at Rabén & Sjögren's Best Children's Book Competition, age 6-10. 1946Begins work as children's book editor at Rabén & Sjögren. 1947-1948First time in England and the USA. 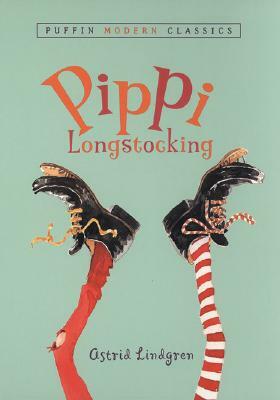 1949Hamburg publisher Friedrich Oetlinger travels to Stockholm and meets Astrid Lindgren, acquires translation rights to Pippi Longstocking. 1956Deutscher Jugendbuchpreis, Sonderpreis (German Prize for Children's Books, Special Award) for Mio, My Son. 1957The Swedish State Award for Writers of High Literary Standard - Astrid Lindgren is the first children's literature author to receive this award. 1958Astrid Lindgren receives the Hans Christian Andersen Medal (International Children's Books aAward), for Rasmus and the Vagabond (for the same book, she also received the Boys' Club of America Junior Book Award. 1959New York Herald Tribune Children's Spring Book Festival Award for Sia lives on Kilimanjaro. 1961Her mother, Hanna Ericsson, dies. 1965Swedish State Award for Literature. 1967Rabén & Sjögren and Friedrich Oetinger establish the Astrid-Lindgren Award; Astrid Lindgren travels to the USSR. 1969Astrid's father, Samuel August, dies. 1970Retires as children's books editor from Rabén & Sjögren; receives the Golden Ship Award of the Swedish Society for the Promotion of Literature, the Heffaklumpen of the Swedish newspaper Expressen for Emil and Piggy Beast, and the Lewis Carroll Shelf Award for Christmas in the Stable. 1971The Swedish Academy's Gold Medal. 1973Honorary Ph.D. at the Linköping University in Sweden; Lewis Carroll Shelf Award for Pippi Longstocking. 1974Smile Award for Russian adaptation of Karlsson-on-the-Roof. 1975Litteris et artibus (plaque presented by the king of Sweden) and Silvergriffel for The Brothers Lionheart. 1978Friedenspreis des Deutschen Buchhandels (German Booksellers' Peace Award) - Astrid Lindgren was the first children's literature author to receive this honor: she donates half the prize money to German children, the other half to Swedish children. Also received: Adelaide-Risto Award (Rome), International Writer's Prize, and an honorary doctor of letters, Leicester University, England. 1979Wilhelm-Hauff-Prize and the International Janusz-Korczak Award for The Brothers Lionheart. 1984Mildred L. Batchelder Award to Viking Press for Ronia, the Robber's Daughter; Dag Hammersklöld Award (Sweden); John Hansson Award (USA). 1985With over 2 million yearly borrowals in the Swedish Public libraries, Astrid Lindgren is the most often read Swedish author. Received the Illis Quruom (Gold Medal awarded by the Swedish Government); Silver Bear Award for the movie "Ronia, the Robber's Daughter"; Loisirs jeune élu par l'enfant (French children's book award); Karen Blixen Award (from the Danish Academy); Jovanovic Zmaj Award (Yugoslavia). 1986Astrid Lindgren's son Lars and Friedrich Oetinger die; the Swedish Council of America names her "Swede of the Year"; Selma Lagerlöf Award (Sweden) and the Lego Prize (Denmark). Astrid Lindgren founds "Solkatten" for disabled children. 1987Leo Tolstoy International Gold Medal. 1989Albert Schweitzer Medal; honorary doctor at the University of Warsaw. 1993International Book Award (from the UNESCO International Book Committee). 1996The first Astrid Lindgren statue is unveiled in Stockholm's Tenerlunden park (a bronze statue by Majalisa Alexanderson). 2001Astrid dies in Sweden. She is missed!